We recently sent Michael of Inspired by Charm our Mother’s Day Gift Basket. 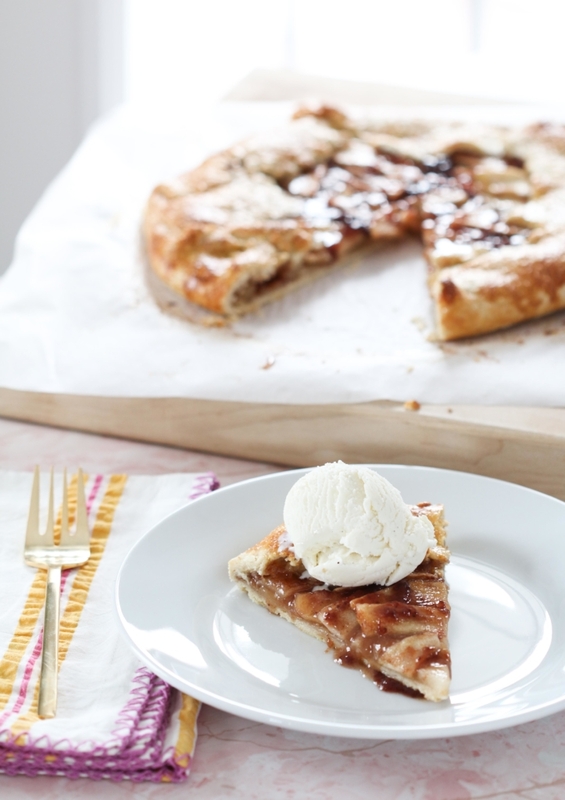 He created an Apple Crostata recipe with a cheese crust that sounds delicious. I cannot begin to tell you how excited I am that spring has finally sprung. Being in Central PA, I feel like the warmer temperatures are always a little bit behind the rest of the country. However, signs of spring are popping up everywhere. One of my favorite things about the change of seasons is an excuse to play around with new and super fresh ingredients in the kitchen. I always like to test my baking skills this time of year, because Mother’s Day is just around the corner. Although I’m not an expert at whipping up a four-course meal to recognize my mom’s awesomeness, I can make a sweet or two in her honor. This year I’m pulling inspiration from the Harry & David® Mother’s Day Gift Basket. To be honest, this gift basket won me over right away because it includes Jordan almonds, one of my favorites. There are also a lot of other goodies tucked inside. In addition to Harry & David® signature chocolate truffles and chocolate decadence cake, this basket includes two other flavor delights: fresh apples and cheese. I decided to use the apples and cheese to make a rustic apple pie, or an Apple Crostata with Cheese Crust, to be exact. If you’ve never made a pie with a cheese crust, you are seriously missing out. The tanginess and depth of flavor added by the cheese is unbelievable. Plus, the apples and cheese gives you that sweet-salty combination, which to me is the perfect kind of dessert. I’m also a fan of desserts that aren’t overly fussy. A crostata’s beauty comes from its imperfect edges and rustic appearance. Trust me; it’s so much easier than attempting a perfect traditional pie crust. To amp up the flavor of the crostata even more, I also made use of the strawberry preserves in my basket. 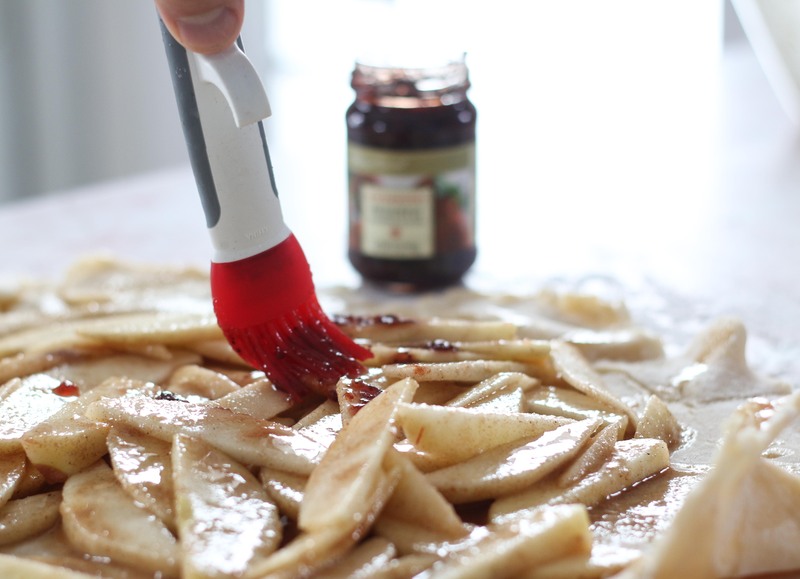 Before folding up this rustic pie, I gave my apples a generous coat of these sweet preserves. 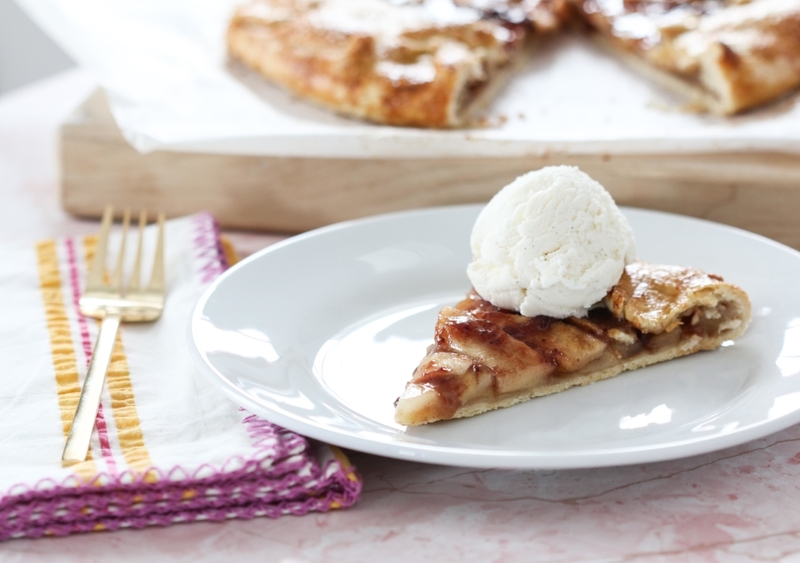 Again, this added another level of flavor which pairs perfectly with the apple and a big scoop of vanilla ice cream, which you’ll add just before serving. (In my book, vanilla ice cream is a must for any fruit pie.) I think I’ve found a winning desert for this year’s Mother’s Day. What do you think? Gorgeous, rustic, and totally delicious. Wishing all the moms out there a very happy and joy-filled Mother’s Day! In a large bowl, mix together flour and salt. Then add in the cold, cut butter and cheese. Using a pastry blender, mix together until the mixture resembles coarse crumbles. Slowly add one tablespoon of ice water at a time, mixing the dough together with your hands until it forms into a ball. Shape the dough into a disc, wrap in plastic wrap, and refrigerate for at least 30 minutes. In the meantime, in a large bowl, toss together the apples, sugar, flour, lemon juice, and cinnamon. Set aside. Next, preheat your oven to 375 degrees F. Remove your dough from the refrigerator and, on a lightly floured surface, roll out to a 13-inch round circle. The dough should be about 1/8-inch thick. Transfer the dough to a parchment-lined baking sheet. 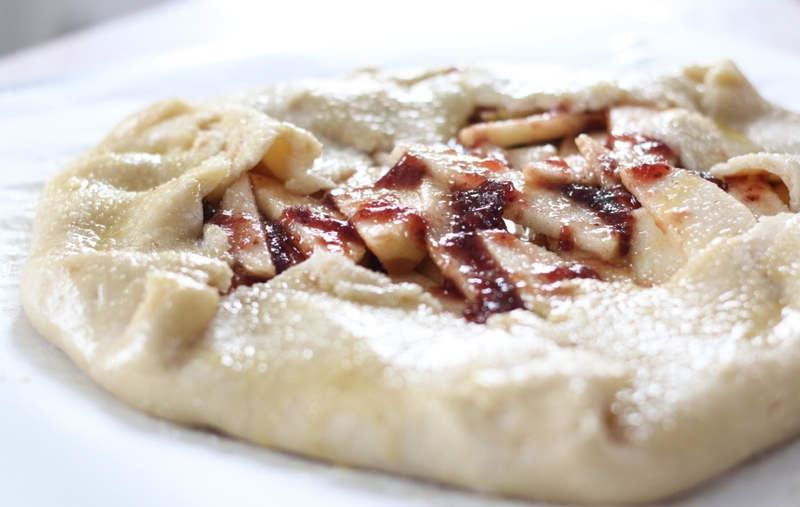 Spread out apple filling over the dough, leaving about a 1-1/2-inch board. Brush the apples with strawberry preserves. Fold edges in to form a crust; brush with egg wash, then sprinkle with sanding sugar. Bake crostata until the apples are tender and the crust is golden, or about 1 hour. Allow to cool before serving. Top with vanilla ice cream for epic deliciousness.